Ad # 538040 has been disabled. Glendo started as a stagecoach and Pony Express station in the 1800s. Today it is known for the excellent recreational opportunities nearby. Glendo Reservoir offers beaches, picnic areas and great fishing. It is also home to a State Park. The reservoir is located on the North Platte River. Wildlife abound in the area with deer, antelope, elk and waterfowl. Within sight of 10,272 foot Laramie Peak, Glendo Reservoir serves as an important resting and feeding place for numerous wetlands birds. It is also very attractive to migrant and nesting passerine species as they follow the North Platte River during migration. Glendo Dam and reservoir are features of the Pick Sloan Missouri Basin Project - Glendo Unit. Located on the North Platte River, 6 miles southeast of the town of Glendo, in Platte County. Boat Docks: Are they permitted? 30-40 ft. Depth of Lake: 180 ft. Available species include walleye, yellow perch, and channel catfish. Channel catfish are stocked in the reservoir. Brown trout, rainbow trout, and channel catfish are stocked in the river above the reservoir. Below the dam, the river is stocked with brown, rainbow, and cutthroat trout. Plans to stock the river immediately below the dam with largemouth bass and channel catfish. The Glendo Dam Wetlands Trail, located along the river, just below the dam, features two fishing/observation piers. Glendo has excellent fishing to offer. Heavy walleyes are in abundance in Spring and early Summer. Although its not known for its Crappie fishing, Glendo holds the state records for both white and black crappie. White at 2.31 lbs., and black at 2.50 lbs. Catfishing is good, if you know where to go. Any information on these areas would be appreciated. There is excellent Camping at Glendo and a lot of it. It was reported in the 2003 North Platte News letter that the average sized walleye in the reservoir is over 19 inches! Across from Glando Powerplant below the dam, there is a boat ramp giving access to the North Platte River. Recreation is managed for the Bureau of Reclamation by Wyoming State Parks and Historic Sites. Located on the North Platte River, 6 miles southeast of the town of Glendo, in Platte County. Access from I-25 via County Rd. 17 (Glendo Park Road). 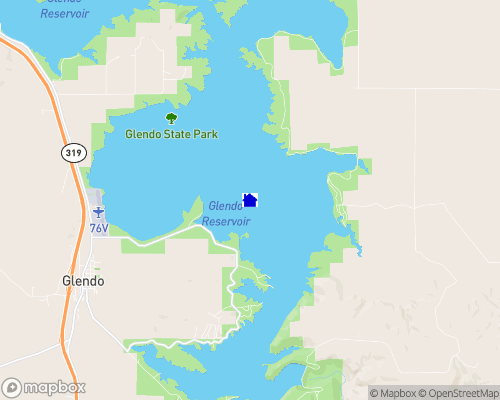 Glendo State Park has 7 campgrounds, 6 boat ramps, and a marina concession. Scenic overlooks and three interpretive nature trails. The Muddy Bay Wetlands Interpretive Nature Trail is located on the east side of Muddy Bay. Glendo Dam Overlook Trail is located north of Glendo Dam. Laramie Peak/Medicine Bow Mountain Range has hiking, camping, hunting and fishing. Guernsey State Park and Reservoir, Register Cliffs and the Oregon Trail ruts are in Guernsey. Other attractions include: Fort Laramie National Historic Site, Wheatland Grayrocks Reservoirs; plentiful wild game, especially antelope and deer. Chugwater is on the way to either the South Dakota Black Hills, or the Tetons and Yellowstone via I-25.